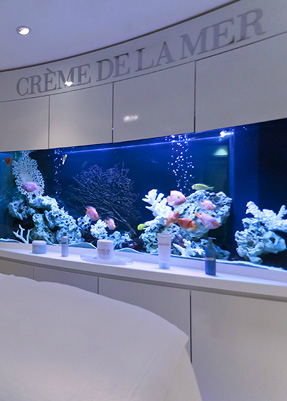 Crème de la Mer at Harrods of London launched The Spa Experience, along with De La Mer in Japan at the Tokyo Beauty Park. 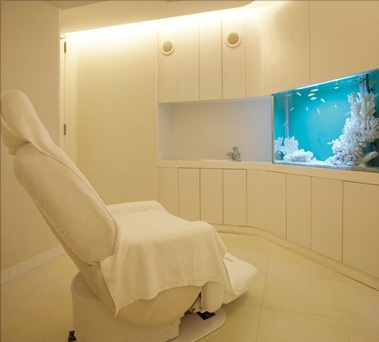 Unlike the complimentary South African counterpart, The Facial, the La Mer treatments at Harrods range from £100 to £205, covering up-to top-to-toe La Mer treatments on the famous 5th floor well-being haven in a relaxing treatment bed, with the customary ocean sounds, overlooking a the signature La Mer tropical fish aquarium. 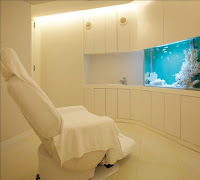 You may opt for The Facial at 60 minutes (£100), the Ultimate Facial for an hour and a half (£155), the Body Treatment at an hour and a half (£115), or the Ultimate Experience at 2 hours and 15 minutes (£205), where you start by placing your feet into a hole in the treatment bed, to be exfoliated and pampered. Your face then gets steamed with a warm towel, followed by a shoulder and neck massage, customized cleansing, then The Refining Facial , followed by The Spa Experience exclusive - a pure concentration of the Miracle Broth! You then get lathered in The Crème , and while your skin absorbs the magical crème, you receive the hand and arm massage, I never realize how much tension there is in my hands! After another quick steam, suited to your skin's needs, you get treated the various tonics (The Hydrating Infusion remains my favorite), serums, and either of the eye creams. Completing your experience, is the another application of one of the 4 La Mer Crèmes - The Gel , Lotion , Oil Absorbing Lotion or Crème , ending with The Lip Balm and a spritz of The Mist . The session is ended with the La Mer Expert sounding a tuning fork to transfer sound waves that were emitted to your body and mind, restoring your balance an awareness to the spa room, whenever I feel this relaxed there's only one way to make me feel even better, and that's some retail therapy, it's Harrods after all! Also available is La Mer Salon, in the comfort of your home or hotel, in and around London. If you're in Miami at the beginning of December, keep on eye out for the pop-up Spa de la Mer! That's hoping they fly in the La Mer Aestheticians from La Mer London in again this year!